The attempt to forge thought into form - to introduce shapes that provoke, reveal and deceive us. Sculptures that address the limits and spacial wonderment of our three dimensional world. The 20th Century was generous with contemplative artists who, through experimental pushing and prodding, have physically personified the human experience - managing to mold "mood" into modern design. This month, Bidsquare will host two auctions offering artworks by renowned Ceramic and Glass artists such as Harry Bertoia, Karen Karnes, Dale Chihuly, Alex Bernstein, Marvin Lipofsky, Toshiko Takaezu and many others. 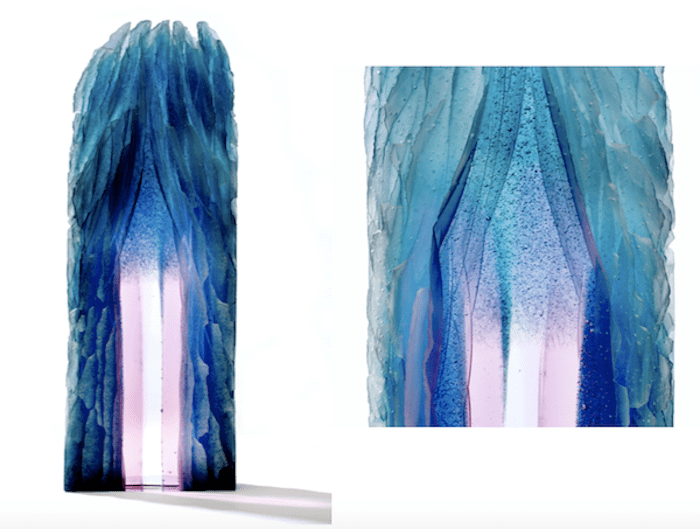 Wexler Gallery's Contemporary Glass from 1979-2011 will run exclusively on Bidsquare in the Timed Auction format from April 9th - 23rd and Cowans Auctions Modern Ceramics & Modern Art + Design: Live Saleroom Auction will commence on April 21st. 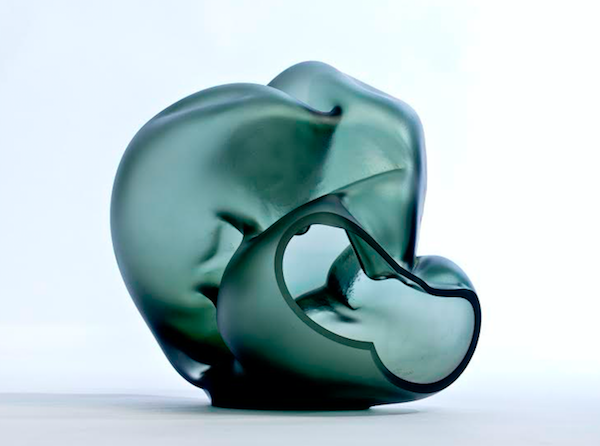 Wexler Gallery | Marvin Lipofksy (1938-2016) Lot 29, Zwiesel Series, Smoke Gray, Mold blown glass, cut and acid polished, 1980; Estimate $5,000 - $7,000 | Marvin Lipofksys complex glass forms are largely celebrated for their inventive and performative production process. Lipofskys molds, made of staggered metal beams, were constructed to force positive and negative spaces when "pushed down and blown" - openings allowed the glass to expand, creating puffed out sides, while areas of tight cavities were crushed and cooled into place. Lipofksy then cut into and sanded the pieces, exposing the graceful opposition of the bulbous air pockets and collapsing folds. His recent passing in January 2016, resonates deeply with the global glass community - in his lifetime Lipofsky traveled to 30 different countries and taught over 300 workshops. His organic approach bravely reminds artisans to investigate their medium and attempt to eclipse traditional convention. Decorated as a renowned San Francisco Bay Area teacher and sculptor, Marvin Lipofskys pieces have been internationally collected by museums such as the Corning Museum of Glass, the Museum of Art and Design in New York, the Oakland Museum of California, the San Francisco Museum of Modern Art and many others. 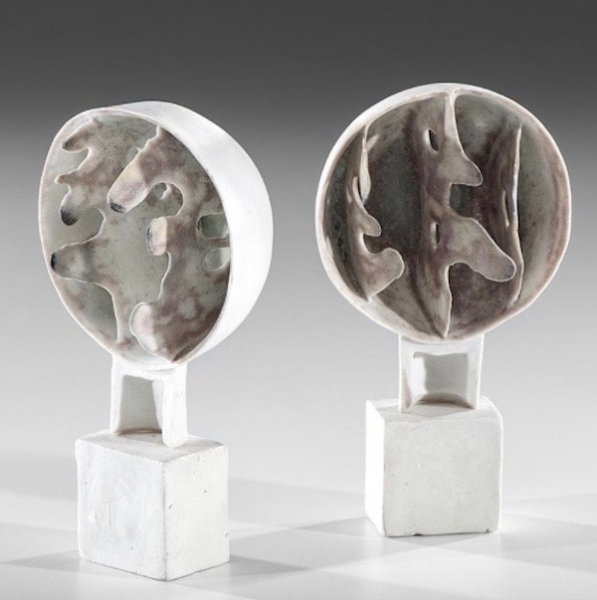 Cowans Auctions | Ruth Duckworth (1919 - 2009) Lot 74, Pair of Untitled Suclptures, Porcelain, ca. 1964; Estimate $1,500 - $2,000 | At the age of 17, Ruth Windmüller fled Nazi occupied Germany to pursue an art education at Britains Liverpool School of Art. 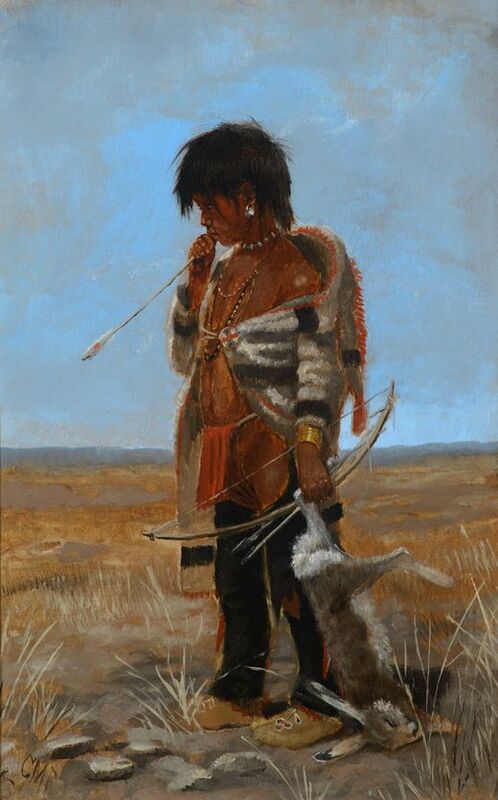 Her faithful escape from the genocide that was to plague her homeland, would leave one of many lasting impressions on the artist. Later named Duckworth through marriage, her experience as a Jewish refugee and personal struggles with depression, poverty, and other close brushes with death, wedged an instinctual pang of fear inside of her. Surprisingly, it wasnt until 1956 - well into her 40s - that she would find solace through clay and begin mandating her revolutionary station in the ceramic world. Duckworths conceptual developments introduced unorthodox ideas to the medium that baffled functional potters and motivated modernists. Her blatant abstraction would stylistically impact and challenge ceramic studios across Britain well through the 1970s. The pair of sculptures offered in Cowans Auctions upcoming sale are superior examples of her early porcelain works. They are genuinely modern - potent and enigmatic. The white "fins" protruding from face of the works also echo the naturalistic elements seen in her most recognized public work, "Earth, Water and Sky," installed at the University of Chicago. Duckworths creed, "not to think," as she worked contributes to the intuitive force of her sculptures. As she once stated, "Most of my works come from play, playing with the clay. Thats the most creative thing you can do. Is play." Cowans Auctions | Robert Turner (1913-2005) Lot 88, Untitled, Stoneware, ca. 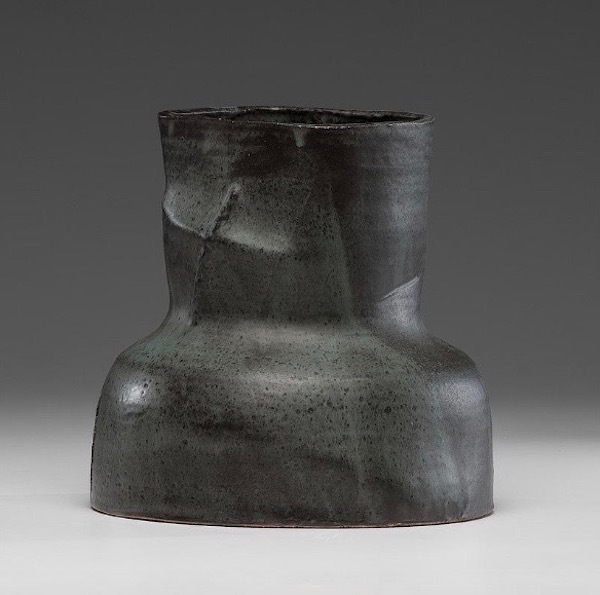 1975; Estimate $3,000 - $5,000 | Like so much of Robert Turners broad bottomed, cone shaped vessels, this ominous ceramic form manages to convey purposeful depth despite its remarkably simple shape; like a dark cast shadow lifted off the surface of a table to stand upright in the physical world. Turners understanding of geometrics and his interpretive impact on the abstract form has made his name synonymous with the progression of American ceramics. Spanning over 60 years - Robert Turners ceramic career afforded him ample time to perfect wheel-thrown, functional wares during the 1950s-60s with decades left to deconstruct, depart and redefine his artistic ideology. The 1970s proved transformational for Turner as he began empowering his pieces with West African references as well as drawing inspiration from his clay contemporaries. In addition to receiving the Gold Medal from the American Craft Council, Robert Turner taught at Alfred University School of Art & Design, started the ceramic program at the Black Mountain College in North Carolina and affiliated himself with Americas top ceramic academies. Many of the works found in these catalogs share the formal title, "Untitled" - or simply bear their literal descriptions. This unifying idea of "Un-titling" forms, excuses abstraction from leaning on predetermined definitions and urges the viewer to read the form (not the title). By removing the artists personal feelings from the work, these sculptures will continue to take on the connotations of the eras in which they are seen; how will these forms be interpreted millennia from now? Click here to view the full catalog: Wexler Gallerys Contemporary Glass from 1979-2011 from April 9th - 23rd featuring multiple stunners by Dan Dailey with estimates ranging from $20,000 - $30,000 as well as a power glass floral "Ikebana" sculpture from Dale Chihuly having a $15,000 - $20,000 estimate. Click here to view the full catalog: Cowans Auctions Modern Ceramics & Modern Art + Design: Live Salesroom Auction on April 21st featuring a classic "Bush Form" bronze by Harry Bertoia estimated $10,000 - $15,000; Two pieces by American ceramicist Karen Karnes including a "Lidded Vessel" with an estimate of $1,000 - $1,200; In addition, this sale will feature Mid-Century Modern furniture from designers such as Paul Evans and Hans Wegner as well as several original works by Andy Warhol.